A type of coin with the picture of Kaptain K. Rool. Unlocks levels when given to Klubba. 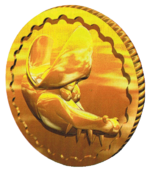 Kremkoins are large golden coins found in the games Donkey Kong Country 2: Diddy's Kong Quest and Donkey Kong Land 2. In Donkey Kong Country 2, two to three Kremkoins are found in every level. In order to obtain a Kremkoin, Diddy Kong and Dixie Kong must find a Bonus Area and beat its challenge. Once the task is done, a Kremkoin will be awarded to them; a Kremkoin can also be obtained by defeating a game boss. Kremkoins are needed to pay off the Kremling Klubba; once Klubba is paid fifteen Kremkoins, he will allow the Kongs entrance to a portion of the Lost World. There are seventy-five Kremkoins in the game. In Donkey Kong Land 2, Kremkoins serve the same purpose as in Donkey Kong Country 2; they are needed to pay for access to the Lost World. In this game, there are only forty-seven Kremkoins, and they all have to be given to Klubba at once to enter the Lost World. In Donkey Kong Country 3: Dixie Kong's Double Trouble! and Donkey Kong Land III, Kremkoins are replaced with Bonus Coins. In the Lost World, there are Bonus Barrels, but when beaten, these Bonus Barrels yield DK Coins instead of a Kremkoin. Because of this, there are no Kremkoins to be found in the Lost World. Likewise, the player is given a DK Coin instead of a Kremkoin for clearing Krocodile Kore. This page was last edited on January 18, 2019, at 20:15.